I have a new HP laptop that came with Windows 8 - I upgraded to 8.1, which I think went AOK, but now it says 'you're not connected' and I can't get on the Internet. Yes, it's a wireless connection - but I can't find the wireless card! 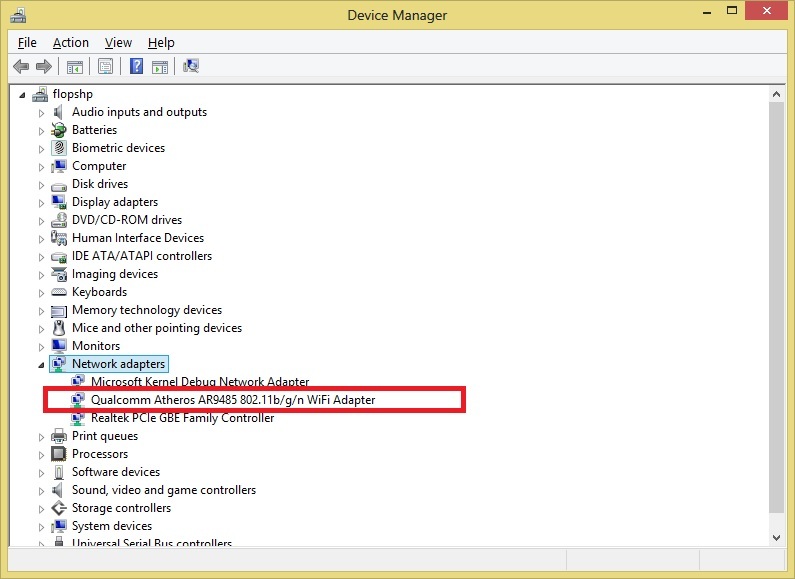 look through the entire device manager for anything with a red ! or yellow ? on it. Do the same thing with any of them that you find. highlight and press delete to uninstall them the wireless card might have been installed improperly as something else and it would come up like that. I am not sure what your point is about working fine until you went to 8.1. It worked fine and now it doesn't. If you have a wireless card it needs to be in the device manager for it to work at all. I am waiting for you to find it. I have a "HP ENVY TouchSmart 15t-j000 Select Edition Notebook PC"
Please do check for an upgraded driver. Any more hints on how to find the wireless card? there are 5 possible drivers for it for 8.1 on this page you kind of have to know which card they put in it. ok, I assume I found the wireless card, thanks to your hint about Network Adapters. It was an Intel Centrino Wireless-N 2230. Then, going back to the top of this chat, I uninstalled and rebooted. No help. My list of Network Adapters shows 3 others: a Bluetooth Device (Personal Area Network), Bluetooth Device (RFCOMM Protocol TDI), and a Realtek PCle Family Controller. Should I uninstall/reboot any of these? the intel is not listed in their driver list for that model. so I would try one or all of the others maybe the pc picked it up wrong and that's why its not working. Otherwise you might have to ask hp why they don't have a driver for the card they put in your particular notebook and see what their solution is. I like your suggestion about HP and 8.1, though. Thanks! have you got an Ethernet cable ? You should be able to attach that between the router and the laptop long enough to download something. I'm done - I have mobility problems and it's very hard for me to mess around with cables. ok there is limits to what I can do from here to help with that. you can download to a different computer and put it on a flash drive. Thanks, XXXXX XXXXX Let's leave this where it is. Do I owe any more money? I have nothing to do with billing. I am not even allowed to answer questions on it. But usually they ask for a deposit or a subscription before the question is asked. All I am allowed to say is that if you would give me a good rating that allows me to be paid by the site so I would really appreciate if you would do that for me. Is Windows 10 available on my laptop?/ i have windows 8.